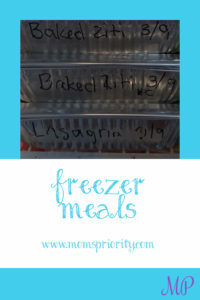 Freezer meals are perfect for busy families! It’s important to know that we’re feeding our families healthy meals, but with busy schedules, we just can’t afford to spend hours in the kitchen! The Freezer and the Slow Cooker are the best inventions for busy parents, aren’t they?! About once per quarter, I buy chicken breasts and ground beef in bulk (when they’re on sale), and make up meals to store in our freezer for busy weeknights. In our area, a good price is $1.99 per pound for boneless skinless chicken breasts, and $2.99 per pound for lean ground beef. 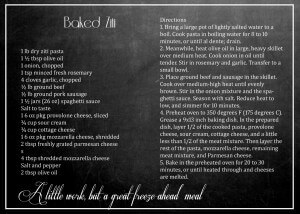 Recently, I made 2 Baked Zitis and 1 Lasagna. Sometimes, I make up chicken enchiladas, tex-mex chicken, and poppyseed chicken. I use disposable pans from the dollar store to minimize clean-up and so I’m not using all of my dishes in the freezer. I label them with the name and date, so I know what’s in there. It makes life SOO much easier during busy times of the year. Knowing that I have a real meal waiting in the freezer keeps us from eating out all the time, helps us stay on budget, and is just comforting! For the chicken, the easiest thing to do is to put chicken breasts in the crock pot with a jar of salsa emptied on top. Let that slow cook all day, and then you have great pull-apart meat for your chicken enchiladas and also for any other Mexican dish you might have. You can freeze the chicken meat in a Ziploc bag in good portion sizes for your family with the name and date on the bag. You can do the same with chicken and barbeque sauce, Caesar dressing, or buffalo wing sauce. Ground beef works well in baked ziti, lasagna, spaghetti sauce and also chili. Homemade chili is a great option to have in the freezer for a busy night. 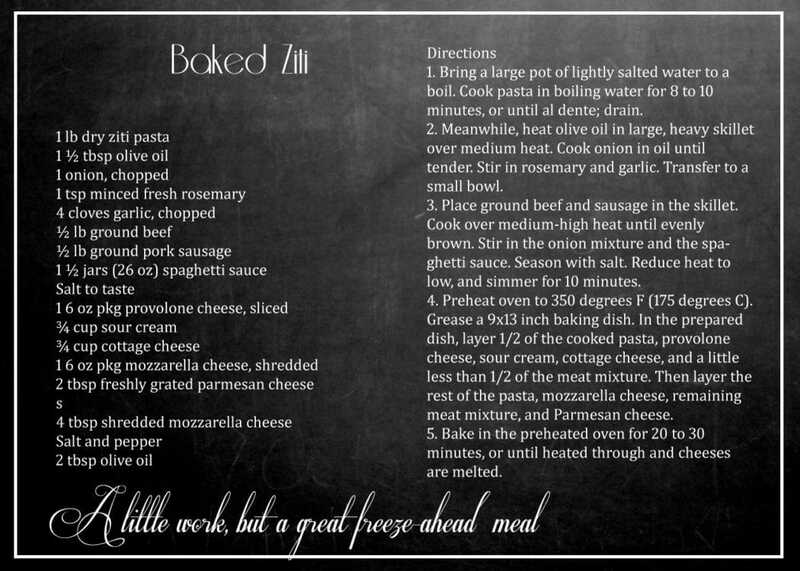 Baked Ziti is perfect as a freezer meal; pull it out for company or just your family on a busy night, and enjoy! Find your new favorite freezer recipes on our Pinterest page!